Theodore Wright's chronicles of the ancient tombs always fascinated his great granddaughter Veronica. Guided by the old maps found in his journals, she has reached the unknown mysterious land once ruled by Emperor Markshnun. 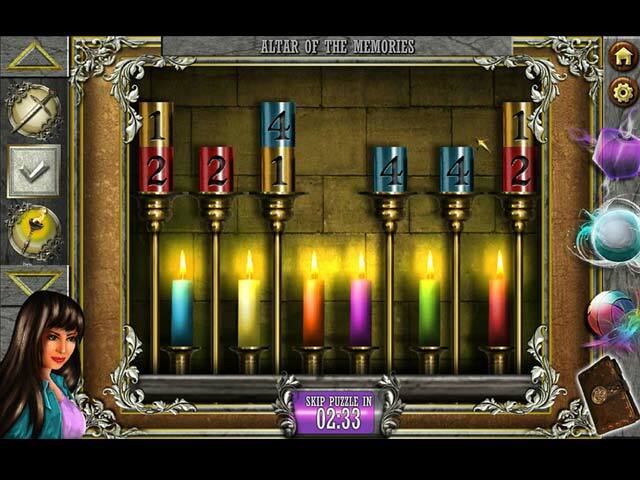 Embark on this challenging mission with Veronica to find the Lost Tomb. The Lost Tomb is rated 2.3 out of 5 by 18. Rated 5 out of 5 by mike565 from Excellent Mix of Match 3 and Puzzles This is a Match 3 Game which is not just levels and levels of match 3! This game has a nice mix of match 3 as well as puzzles. There are 3 types of match 3 games (collecting gems, clearing gold tiles and drop to collect clues.) There are also 3 power- ups and a journal to help you with the clues. The puzzles are very interesting. The story is decent with nice locations and gives you a feeling of a puzzle adventure game. The game is also visually fine. Definitely recommend this game if you want to try a different type of match 3 game. Rated 5 out of 5 by arnold1049 from NO TIMER! I played the demo and loved every minute. I was surprised and disappointed to find that the hour was already over. The storyline is about a granddaughter searching for her grandfather. He disappeared while searching for a lost tomb. He left her an amulet that could have been taken from the tomb and could be the source of a curse that led to her grandfather's disappearance. I did not, and never do, play with sound. The graphics are crisp, bright, colorful and clear but kind of cartoonish, which isn't necessarily a detraction. The three different ways to play, (remove gold tiles, drop special objects off the board and collect specific numbers of a certain type of tile) varies from board to board. You do not have a choice of how to play, it is determined by the board you open. This kept the game fresh, as you weren't playing the same type of board over and over again. The powerups charge quickly and are very useful. I did run out of moves a few times and every time the board regenerated automatically. Since there is no timer, I used the power ups as a last resort and continued to make matches anywhere on the board. Eventually, the board regenerated if necessary or tiles were moved around the area I needed to clear and I was able to complete the level without them. There is a sequential map and a journal that help move the play and story along. The map shows that the game has many locations and should take a long time to play. I did collect a couple of inventory items, but did not get far enough into the game to find out how to use them. One puzzle was fairly easy to solve if you know simple math and pay attention while you are playing. I found absolutely nothing to dislike about this game and it is a sure buy for me. Rated 3 out of 5 by Mavarnee from Where's the next one??? I enjoyed playing the game. I agree with the reviewer who complained about the constant repetition of instructions at each level. I don't listen to the sound, and don't care much about stories - all though this story was interesting. But how can you just stop the game in the middle of the story??? To be continued? That's nuts. This isn't a new game so where the heck is the next one? Run out of ideas? I'll recommend the game, but realize there's no end. Rated 3 out of 5 by JeansLady1 from TBC?! This isn't the best, most challenging game of its type, but I enjoyed it overall. You do kind of do the same thing over and over again on each level, so there isn't a ton of variety. The three power ups are good. You don't earn them; they are automatically there at the beginning of each game within each level. Other reviewers have covered the game in such detail that I won't repeat it. Of course you do get into the Lost Tomb. What upset me, after playing the entire game (mostly as an "unwinder" after a stressful day at work) is that as you enter the tomb, the words "To Be Continued" appear. I wanted to throw a rock at the screen - but I can't afford to buy a new laptop. My level of frustration and irritation went up several notches quite quickly. The reviews here are about a year old and I assume a sequel has never been issued after doing a search through Big Fish. To work my way through a sort of mediocre game and get a "to be continued" was not a happy thing for me. I sort of recommend this game, but only if you know it's not the end of the adventure. If anyone knows of a sequel, please let me know. Rated 3 out of 5 by deddu from Find the Lost Tomb This game has good ideas from a developer I haven't seen before, but there is a lot of repetition of instructions which does get a little tiresome. I thought the story was good and there are mini-puzzles in the mix. Basically you clear boards of a certain number of the jewels. You do have an inventory on the left hand side of the screen which you use in the mini-puzzles. There are also three power-ups on the right side to clear a special type of tile, to wipe out a section, or a line. I would recommend the game for a very new beginner to try. Rated 3 out of 5 by brimaz from I wanted To Like It, But.... There are things I liked about this game, but many more that I didn't. I like the fact that it's fast-moving - the game play, that is. Almost everything else slows it down to a level of frustration that makes it not worth playing. Once the tutorial has told you how the game works, it should go away and leave you alone! Instead, on every single level, you're told how to play, as if your brain is incapable of remembering. Another irritation is the fact that it's untimed. I think I can see why - there are so many different tokens on the board each time that it takes a while to look through them to find matches. If it was timed, it would have to be very generous times, and there's no point in that. Overall, an irritating, frustrating game that could have been good. 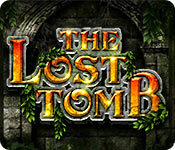 Rated 2 out of 5 by pennmom36 from The Lost Tomb Isn't Worth Finding I really thought this was going to be an exceptional Match 3 game, but unfortunately, it ended up being a mediocre, take it or leave it kind of game. There are three different types of games available, none of which are timed from what I can tell/ The first type requires you to make matches of three or more tiles on top of all gold tiles on the board, the second type requires you to collect specific amounts of specific jewels, and the third type requires you to click on groups of two or more identical tiles under the "clue tiles" There are three different types of Bonuses available to use, the Cross Slash Power bonus will clear a row or column, wherever you choose to use the bonus. The Whirlwind Power bonus will clear a 3x3 section, and the Color Bomb Power bonus will remove all tiles of the same color as shown in the action block. Other directional arrow bonuses are given to you on the board whenever you make large matches, and will destroy all tiles either horizontally of vertically. As you progress, you will receive inventory items that are used to help you solve the puzzles available between sets such as: solving a mathematical puzzle using codes that can be referenced in your journal, or clicking on weights, and mixing them to change their color. I actually enjoyed the puzzles more than the Match 3 game. The Group type Match 3 game was my least favorite, and on several of the levels, I ran out of all possible group matches. leaving me no choice but to use a bonus to end the level and collect the necessary tiles. This game lacks a wow factor, the graphics are decent the storyline is okay, but the game itself is rather droll, in my opinion. Rated 2 out of 5 by Granny_Gruff from Story Muddled, Gameplay Boring I like Match 3 games and have several that I replay periodically. They provide minimal story with some challenge. This one is lacking on both counts. There are three ways to play this game, each differing only slightly from the others. Once you've solved a level, you will get a clue or bit of information and start on the next level. 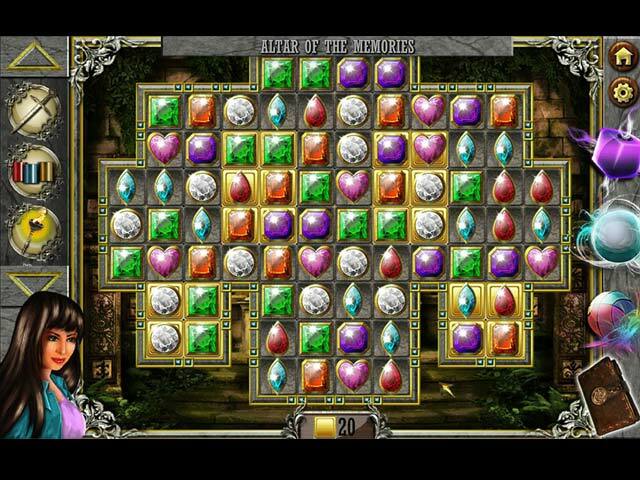 You will switch jewels to match three or more of a specific color; match three jewels to turn tiles to gold; or click on two or more jewels to drop special pieces to the bottom of the board. As far as a story goes, you are returning a piece of jewelry from your grandfather to a mysterious lost ancient tomb. The clues will hopefully lead you to the tomb and whatever outcome there is before you. I just fell asleep while playing and woke up in time to lament the lost evening. This is obviously my own fault for muting the sound. Please play the demo before you buy. Rated 2 out of 5 by imissudakota from wow what a bore I love match 3 games but this one was the most boring one i think i have played in a long time. 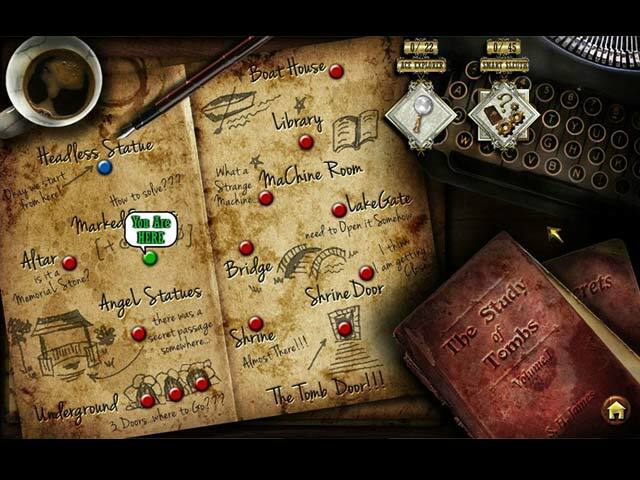 Discover clues, collect items and use them in your quest to find the Lost Tomb.